* estimated part count, no available USD price at time of writing. We’re back, and it’s time for another episode of Friends According To SilentMode. This is going to be our first foray into the new jungle thee they have going on, and this time it;s our favourite stepchild Mia’s turn for the spotlight. 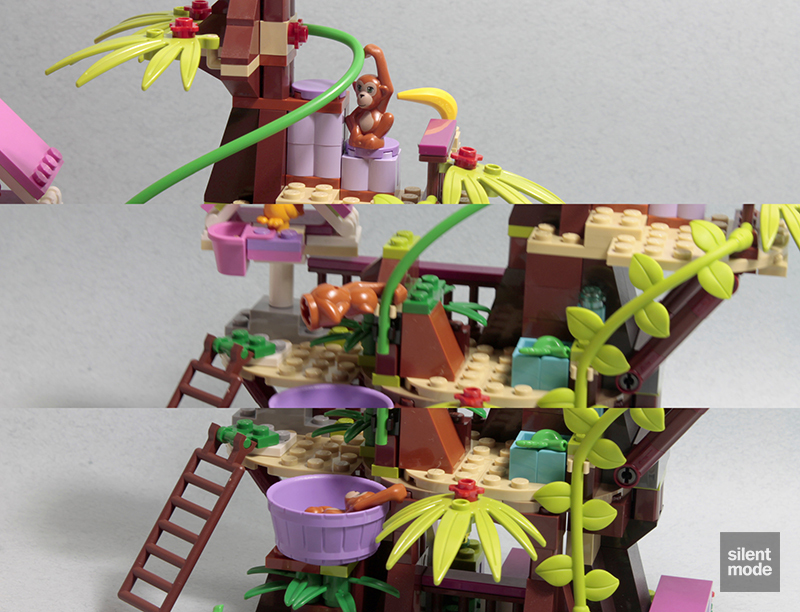 Information about this set isn’t widely available at the moment, but I can confirm that the official name of this set is Jungle Tree Sanctuary, rather than Jungle Tree House as other sites suggest. The proof is in the partial name on the barcode: the last word begins “Sa”. I actually hadn’t thought to include a picture of the barcode, but never mind – you’re more likely to see this on the shelves before anything else. 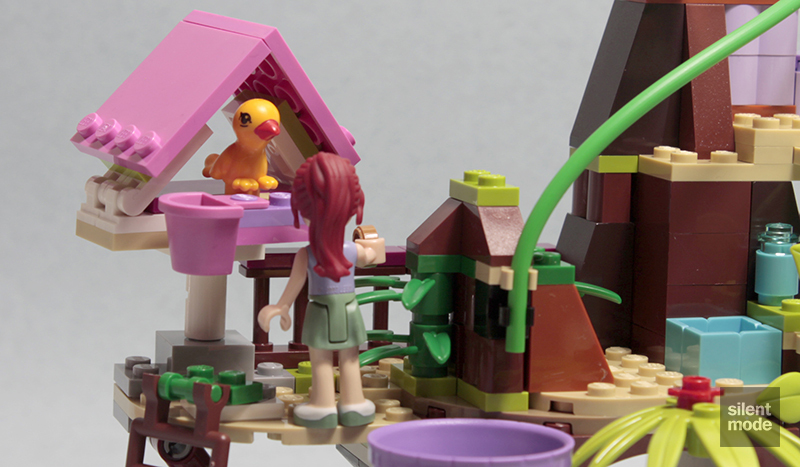 On first glance it’s a beefed-up version of Olivia’s Tree House, the very first Friends set I reviewed. Not that it should be read into in any way, but notice how – out of all the animals on display – Mia chose to play with the cat. 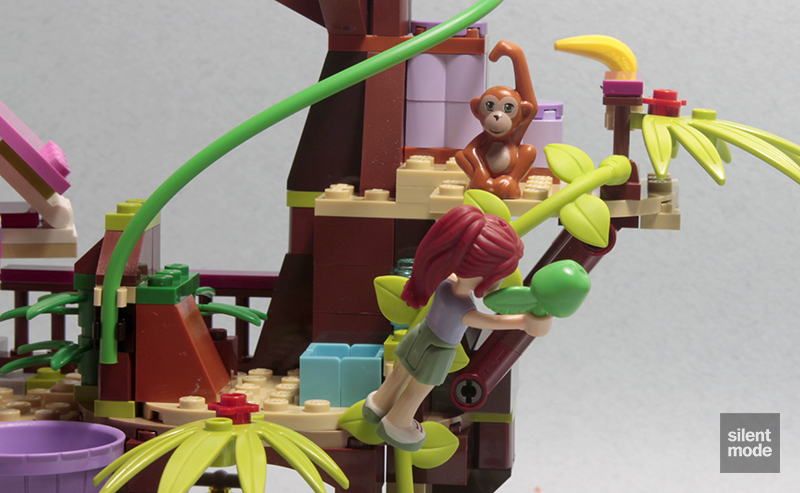 With all the jungle-themed sets in this wave, you’ll notice that each of the highlighted characters is wearing jungle explorer garb. You’ll see all the variations at the bottom. Speaking of being in the position of a missionary: Mia in her jungle outfit provides this week’s scale reference. We get two numbered bags in this mid-range set, and this Green 16×16 plate, accompanied by two Bright Green flextubes, are the only parts outside of those bags. 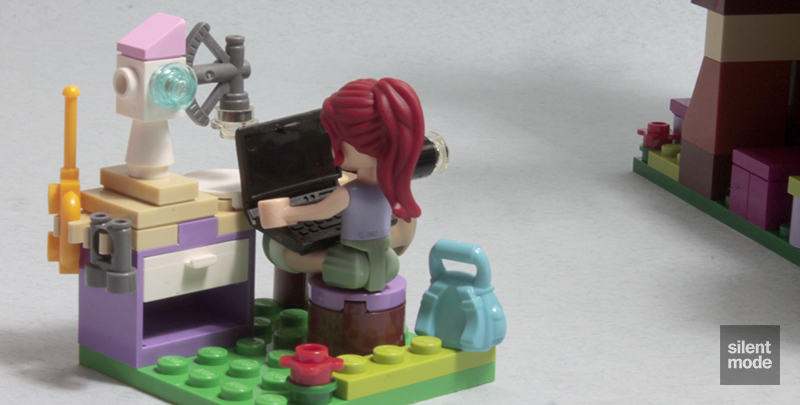 Flextubes are the only LEGO element considered acceptable to cut, so I hear. Yes indeed, there’s a rather small DSS included with the set. Thankfully it’s so small that building the set without it shouldn’t make a huge difference. The once unique Medium Lavender barrel container is joined by a Medium Lavender cupboard (one more for the collection! ), a new mould 2×2 round tile, and some delectable Lavender 1×2 palisade bricks. I’m particularly pleased about the comparatively rare Green 1×1 round plates and the Tan 2×2 corner panel, not forgetting about that Bright Green 6×6 plate. Some unusual parts make an appearance here: there are two plant stalk parts in Lime, which is a new part for 2014 (we’ve seen them in Tiger’s Beautiful Temple; we also have two 1x2x2 slopes in Dark Orange, which I’m sure is going to be bought and hoarded like mad; very unusually we also have a walkie-talkie in Bright Light Orange, and I have no idea why – I guess Black was too masculine for the girls. It was established from the beginning that Mia was the animal lover out of the main five (although each of the others have tried to steal her shine at some point) – and here she is, with no less than four critters. 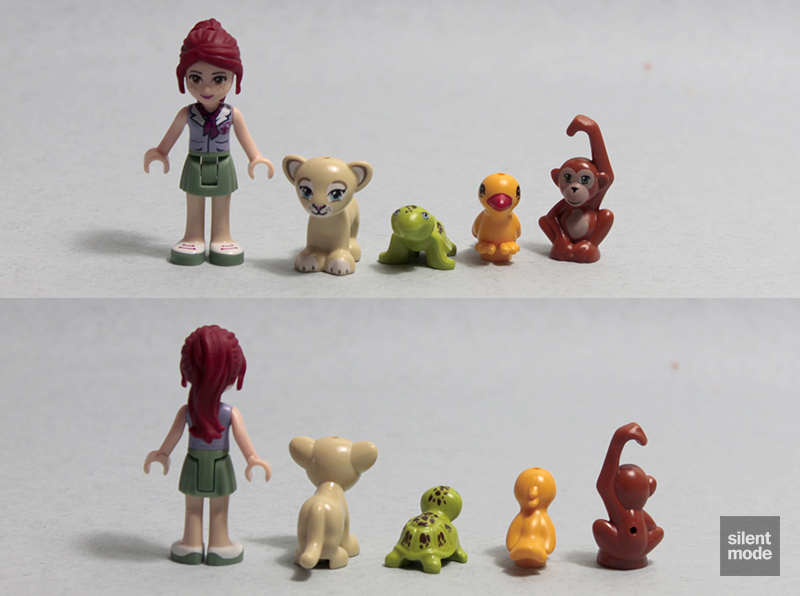 We’re familiar with the turtle and the cuckoo/parrot, but new to the scene (and in Series 5 of the Friends Animals) is the orang-utan, and the lion cub that uses the same mould as the tiger from Series 4. This time Mia is rocking a Sand Green skirt, looking all like a Girl Scout or something. I wasn’t aware of females wearing skirts in the jungle, but oh well..
First on the list of things to build is this desk out in the woods, complete with comfortable seat. 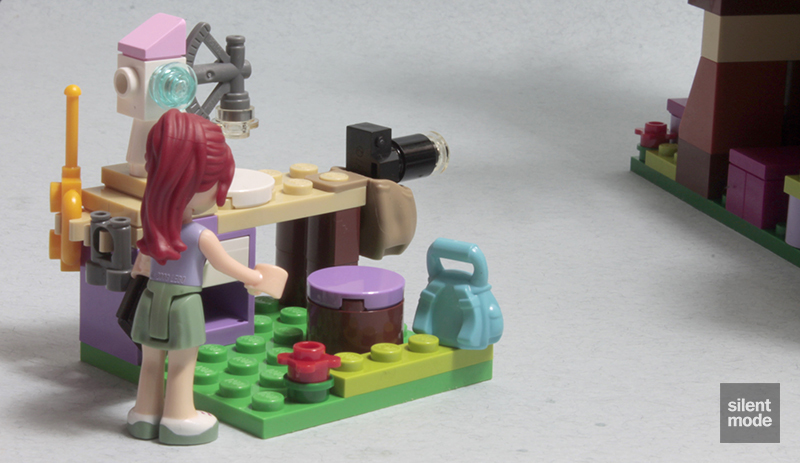 An interesting microscope is built using a White SNOT brick and a sextant, which is rather clever. It wouldn’t be an expedition without a big expensive camera, or a Medium Azure rucksack. A laptop is also stored inside the cabinet; surprisingly nothing is inside that drawer. Using the Green 16×16 plate, work begins on building the sanctuary. What we don’t immediately see from the box illustration is a sleeping area for missionaries, complete with a makeshift table with lamp. The sleeping area is cordoned off by a 1×4 bar fence, and the rest of the landscape is established: a paddling pool for the turtle, and wild plants for the benefit of the lion cub. As we start to build upwards, more of the hollowed out tree is defined using Reddish Brown parts. To be able to get the right beam length and have it connect properly is a tricky feat, but no doubt hours of calculation were implemented to get this down. Seven leftovers from Bag #1 include a spare flextube T-joint (used for the lamp) and a few small parts. Since we’ve seen those 1×1 Medium Stone Grey round tiles in PAB walls, we’re not so excited about them any more. Bag #2 ramps up the interesting-ness in parts, by including a combination of new parts and oldies but goodies. 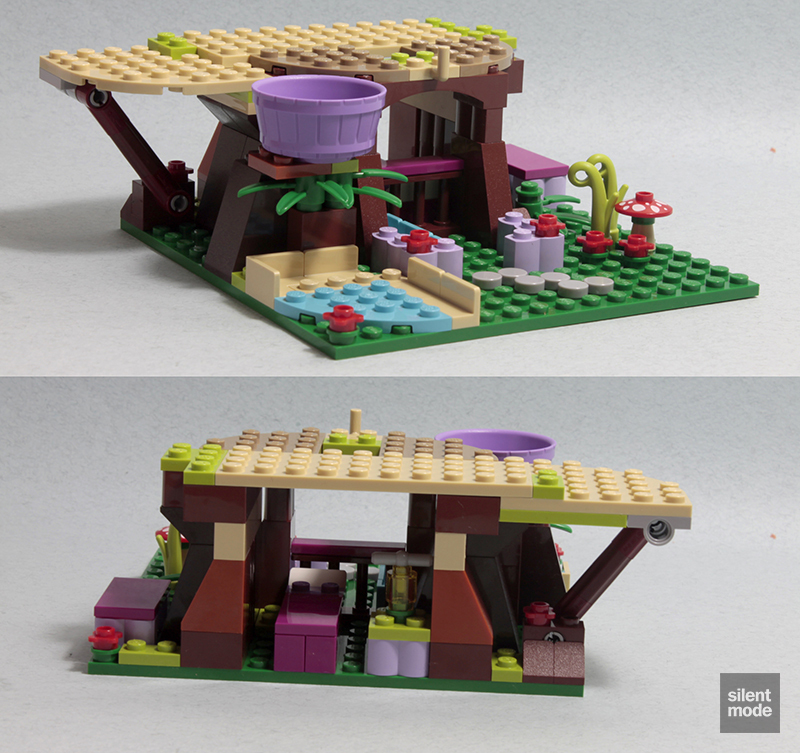 New parts include that long vine part in Lime (leftmost), which is sure to be snapped up at every single opportunity, to the point where it starts to become tacky to use in MOCs. Also in Lime are five suspicious-looking swordleaf plant parts, which have been seen before in Legends of Chima sets. For fans of the 1×1 round tiles, we get another opportunity to obtain the new cookie-printed ones in Medium Dark Flesh, while we get another 1x2x2 slope, five 2×2 plates and one 2×4 plate in Dark Orange. Oh yes: we also get another one of those awesome buckets with handles, even if it’s in Red. Please, please, please release an official one in Flat Silver or Metallic Silver! So work begins on the top areas of the sanctuary, starting with some fencing and a ladder leading up to it. The ladder is fixed in place, so no malevolent minifigures can make off with it this time. Here we’re building another platform near the very top of the tree, with a couple of spots for placing the supporting beams. Unlike with the first platform, the beams are added after the platform is fixed in place, so it will be a little tricky to fit them – however it is possible. 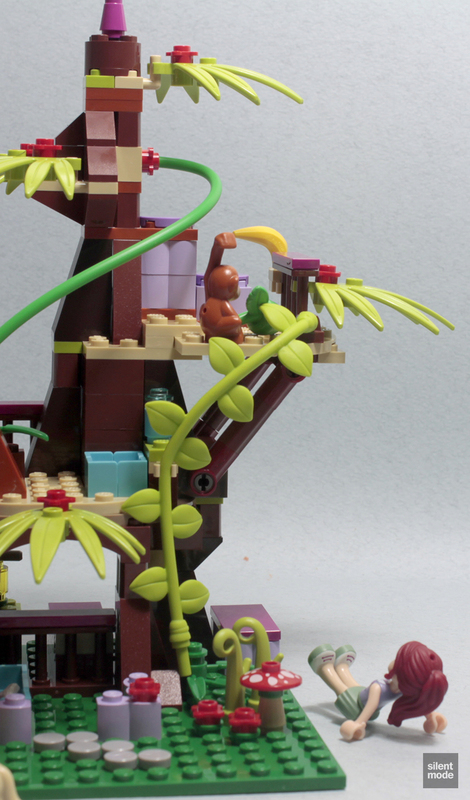 This platform, as is evident by the strategically placed banana, is where the orang-utan will hang out. 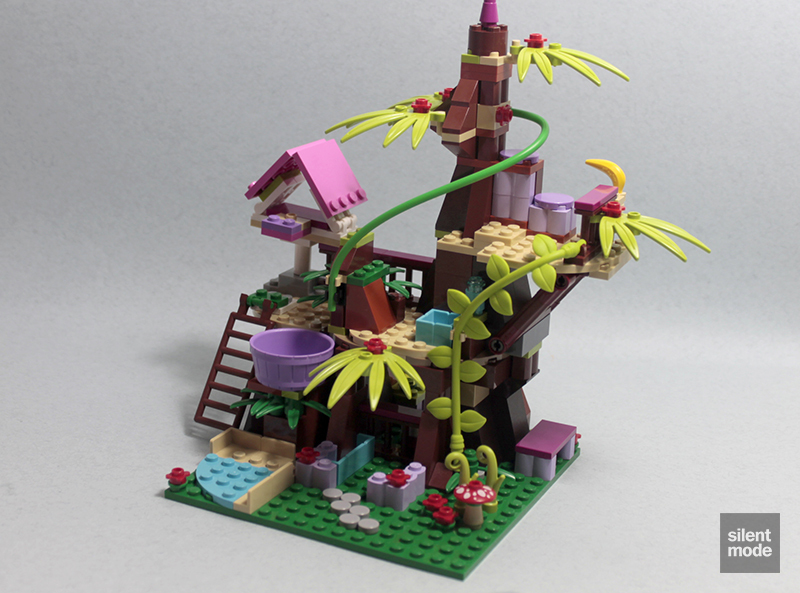 Resembling the build in Squirrel’s Tree House, this bird house is quick and simple. Yet more Technic parts are employed to be able to attach this house to the tree. It sits on that odd Medium Stone Grey brick – usually used for helicopter rotor blades – we added a moment ago. Right at the top of the tree will sit this piece of wood, topped with a hastily made flagpole with some kind of design. That design comes from the DSS shown earlier, but again we don’t use stickers around here. First up, we attach this new vine part to the top platform using a 1×1 plate with clip, than hook it to a clip lower down. As you can see a little bending is required, and the comparatively loose 1×1 clip plate may come off in the process. Even more tricky to connect is this Bright Green flextube, which starts from a SNOT brick under the flagpole and ends inside another clip plate. For this step it will help to connect the flextube to the clip first, then bend the tube and push it inside the SNOT brick. Finally the Lime swordleaf parts are added to the tree, all clipping to something. To our surprise, one flextube serves as a spare, while we’re also left with an extra 1×1 Green round plate and Bright Green plant stalk. I’m not sure how likely we are to lose the other flextube, but with the amount of bending involved we could very well break it. 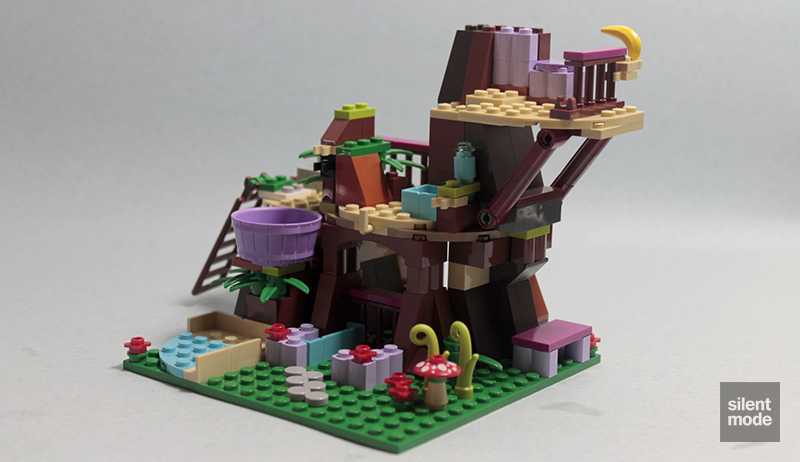 So here it is: a sanctuary deep in the jungle for animals of all kinds, highly reminiscent of Olivia’s Tree House. One of the major play features is that Bright Green flextube, which can be used to make the orang-utan – with its extended arm – slide from the top level into the Medium Lavender tub. It’s a little trickier than it should be to make use of this feature, simply because the orang-utan’s arm has just enough room to fit the tube under it. 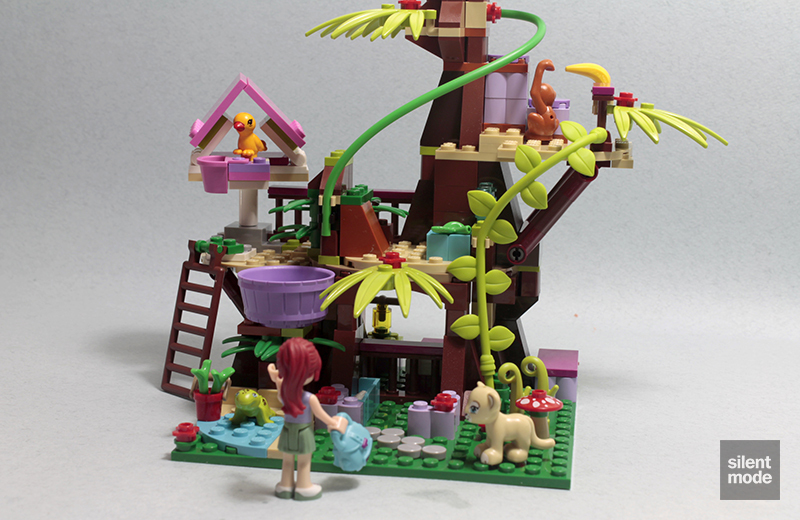 As you’ve probably seen me saying a number of times, the Jungle Tree Sanctuary is a step up from Olivia’s Tree House in terms of complexity, which is no surprise given the increase in parts and the different price point. 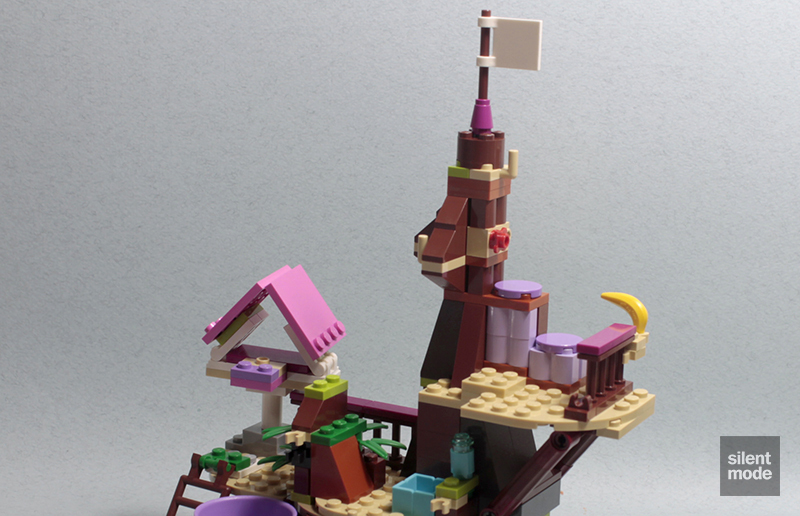 It was certainly a more involved build, with a few tricky steps thrown in – talking specifically about the Technic beams, the vine and flextube – and some of our younger builders may struggle with these steps because they are rather tight connections. 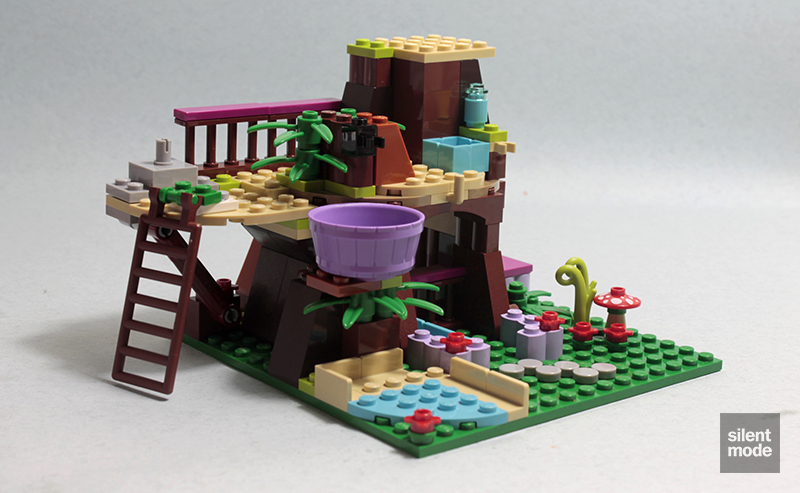 With that aside, the set provides a good example of how to build detailed structures using a combination of basic and unusual parts. 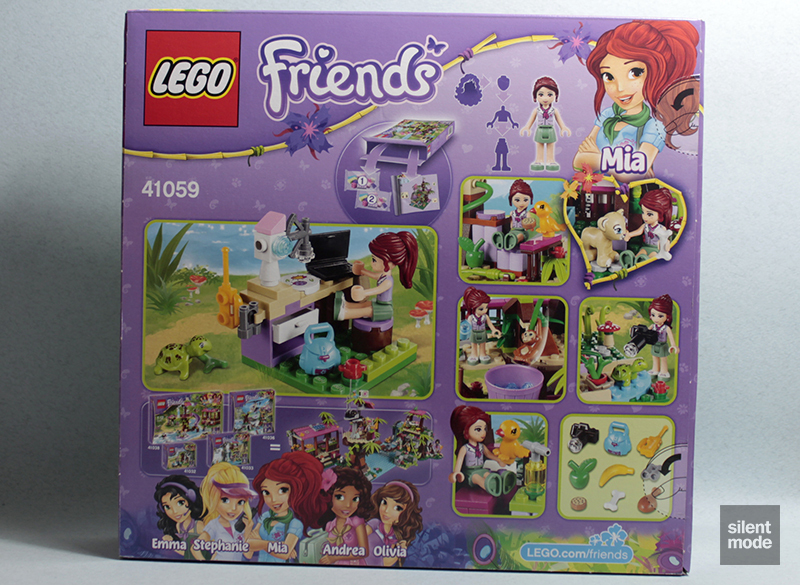 The biggest reason to purchase this set is for the parts, whether you’re interested in minidoll collecting or the vividly coloured parts offered by the Friends theme. 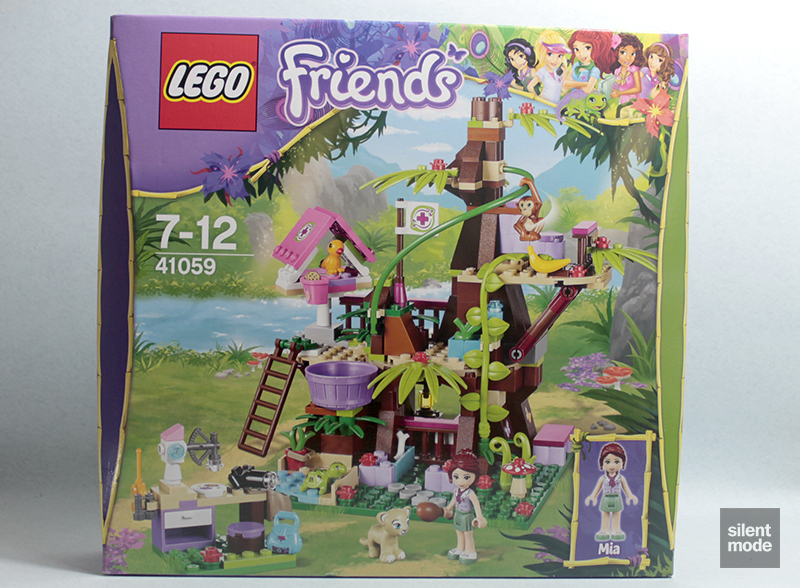 Most of the animals can be obtained elsewhere, with the orang-utan featuring in Series 5 of the Friends Animals sets, and the lion cub is the most appealing of the four anyway. 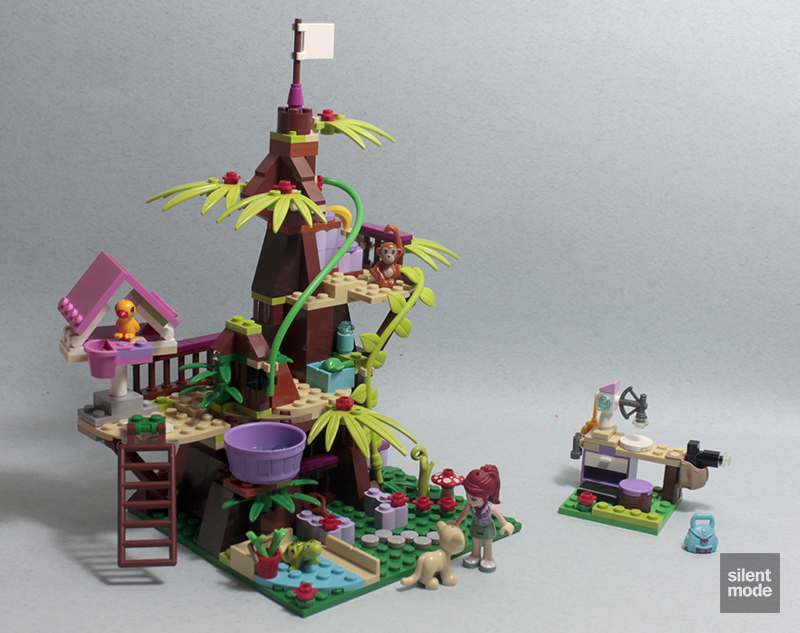 I actually prefer Olivia’s Tree House over Jungle Tree Sanctuary, but I appreciate the fact that this is a newer and larger set with a wider selection of interesting parts… as well as the omission of that darned kitten! A lot worse has been done with 300+ parts, and the end result is an attractive display piece with a little playability. Because of the trickiness involved in attaching some of the parts, this one is for slightly older builders. A rare instance where Lime is more welcome than Green or Bright Green. 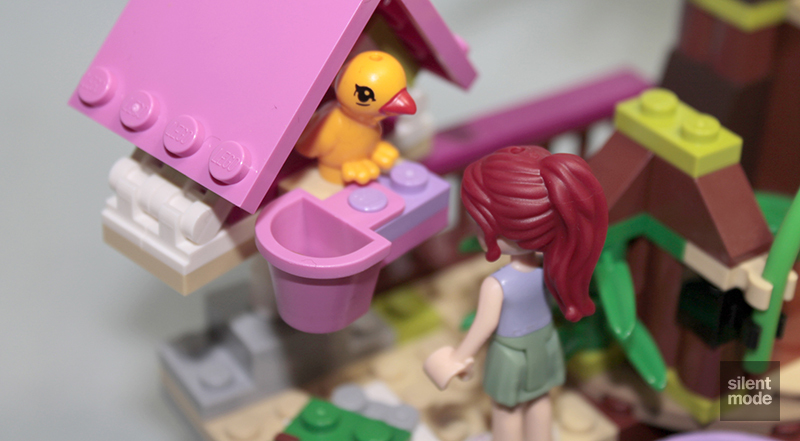 The parts will be particularly interesting for anyone looking to build their own tree house or forest. 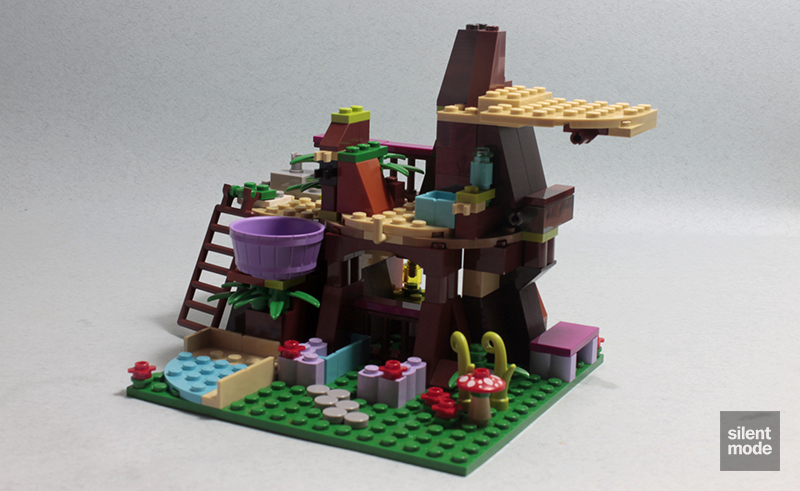 The finished sanctuary is mainly for the animals' benefit, while the minidoll has the desk and sleeping area. The orang-utan sliding down the flextube will likely get old quickly. It may be worth purchasing once at RRP, but I would definitely wait for a discount before purchasing multiples - especially for specific parts. So in the end I’m giving this set 6.6/10. If you like the look of it, make sure you grab a copy while it lasts! We join Mia at the site of her jungle sanctuary: her latest venture, sponsored by Heartlake Vet, to take care of Heartlake City’s dwindling mountain wildlife.